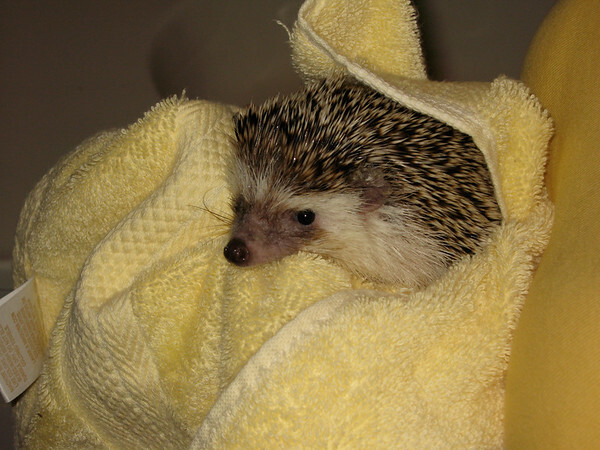 Hedgehogs have naturally dry skin, so you do not want to bath them very often. They may occasionally come across something new and smelly, and have the odd desire to spread it on their quills and get themselves rather messy. This is called self anointing, and depending on what your hedgehog has found, this could create one rather dirty and completely funky critter. Now it's time for a bath. 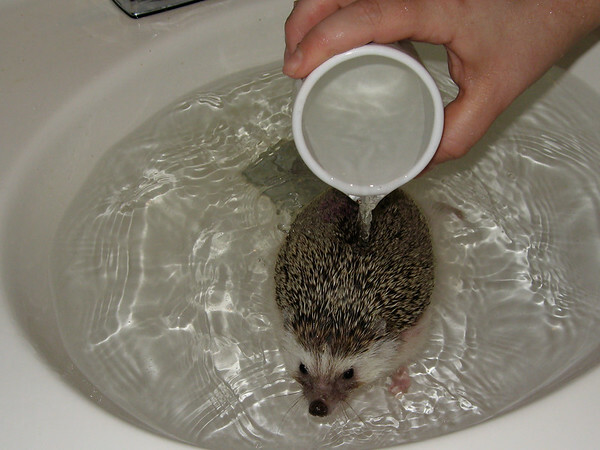 You can bathe your hedgehog in the sink, tub, or a separate wash basin. For simplicity, I prefer to use the sink. 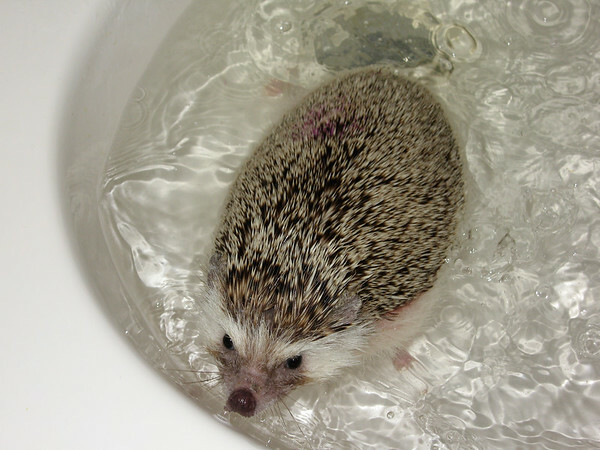 It's best to run the bath water before putting your hedgehog into it since the running water may get too hot or scare your pet. If you must run the water with your critter in the bath, be sure to hold your hand under it to be sure it doesn't get burning hot. Hedgehogs are very good swimmers and it is safe to make the bath deep enough for your little one to swim. Never leave them unattended, as they could tire out and drown or climb out of the sink and fall to the floor. We highly recommend parental supervision if a minor is conducting the bath. To wash your hedgehog, you can use Aveeno Baby Wash, Baby Shampoo, or a mild unscented liquid hand soap. Pour a dime size portion in your hands and lather it up, then gently rub it over the back, belly, and legs while avoiding the face and ears. 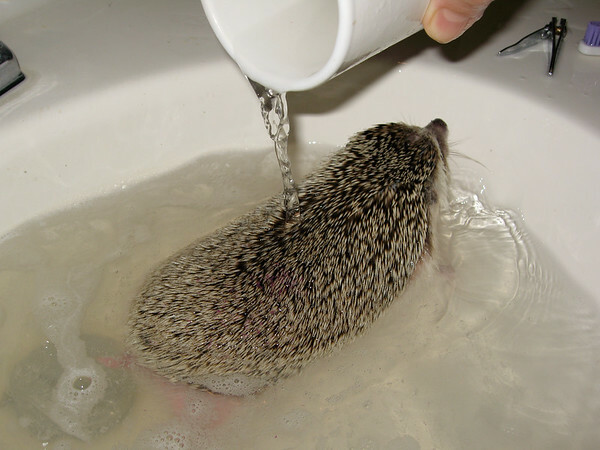 Once complete, use a cup to pour water over the hedgehog's back to thoroughly rinse off all the soap. If there is still dirt on the quills, you can use an old toothbrush to gently scrub it off. * Be sure that you have rinsed all the soap off, then wrap your pet in a towel and gently pat them dry. Since the quills make it very difficult to get your hedgehog completely dry, be sure that they have a warm absorbent snuggle sack to crawl into. Never take your pet outside after a bath; not even on a warm day. Hedgehogs are temperature sensitive, and you don't want your little one to catch a chill. Change out any cage liners or snuggle sacks after about 10 minutes. Wet items will just make your pet cold and uncomfortable. Please only bathe one hedgehog at a time. If you have multiple hedgehogs together in the bath, they could hurt each other by climbing, biting or 'holding on' to one another with their mouths.  * Be sure the toothbrush was never used with anything except toothpaste, as bathroom cleaners will be harmfull to your pet.